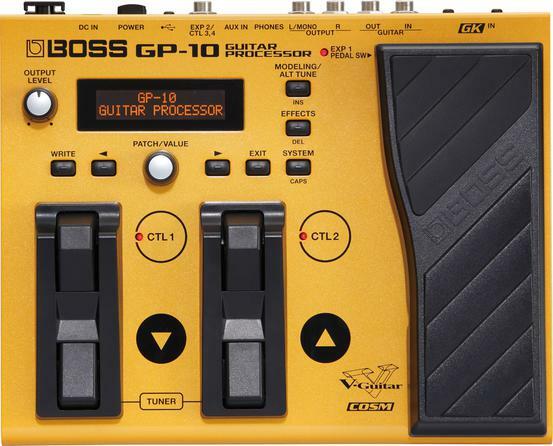 Boss GP-10 GK puts a universe of amazing tones and tunings at your command, all in one compact processor that's affordable and easy to use. With a Roland GK-compatible pickup on your guitar, the GP-10 lets you transform your sound into numerous classic electric and acoustic guitar types, basses, and even analog-modeled synths, including the legendary Roland GR-300. Not stopping there, you have access to instant altered tunings, including popular open tunings, 12-string tones, and 'down' tunings that are essential for today's ultra-heavy rock styles. The versatile GP-10 also functions as a full-featured multi-effects processor for both GK and normal pickups, giving you a huge selection of COSM amps and effects for live playing and studio recording.